Among all the Linux distributions out there, Ubuntu is one of the most popular distributions. Ubuntu includes good set of features and sports an elegant user interface. It’s one of the very few distributions with an eye catching user interface. While most computer users try to make their Linux distributions look like Windows or Mac OS X, there are many Windows users who admire Ubuntu’s interface. Those of you have used or seen the pictures of Ubuntu might want to get the same interface in Windows as well. While there are plenty of transformation packs and theme packs out there to get the Ubuntu feel and look in Windows as well, very few of them actually deliver. If you don’t mind shelling out a small premium ($1.35) to get the best possible Ubuntu look in your Windows 8.1, you can now download a premium Ubuntu theme for Windows. As you can see in the above picture, the theme brings the beautiful Ubuntu look to Windows 8.1. 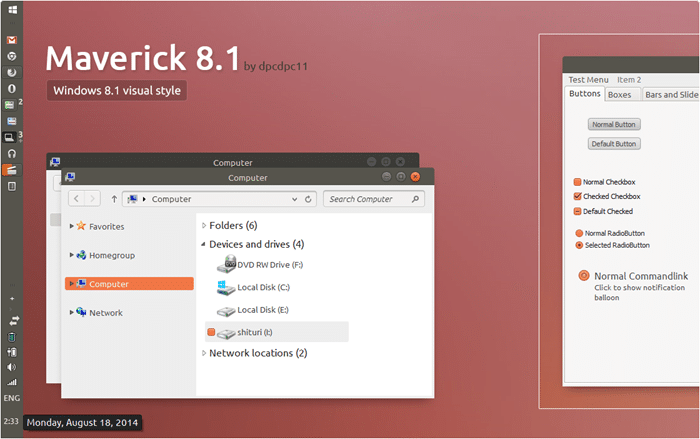 Maverick is a beautifully crafted Ubuntu’s visual style for Windows 8.1. Even though the name Maverick sounds much like a version of OS X, this theme is neither inspired from OS X nor designed to install on OS X. If you’re new to customizing Windows and wondering how to install this theme, you need to first enable third-party visual styles support in Windows 8.1 as it doesn’t let you use third-party themes with default settings. In order to add the support, you need to download and install a free tool called UX Style. Once done, visit the download page to get the visual style and read detailed instructions to install the theme. Last but not the least, please create a manual restore point before attempting to install third-party visual styles in Windows. Please note that this Ubuntu theme is designed for Windows 8.1 and will not work in previous versions of Windows. Interested users who are willing to pay a small premium ($1.35) can visit the following link to get the theme.